Let’s be honest, Utah lacks a world-class art collection (whether that be due to historical circumstances or financial means is a subject for another time); which means that for the non jet-setting citizens of the state it is to traveling exhibitions that one must turn to experience works by the big names of Art History (the ones thousands of college students across the state are encountering this month in their introductory humanities classes). In this regard Treasures of British Art, 1400-2000: The Berger Collection, up at BYU through the end of the year, does not disappoint: Gainsborough, van Dyck, Whistler, Holbein, Singer Sargent . . . they are all here, along with lesser-known, though not always less interesting, talents. But, caveat emptor, while the big names are here, their big works are not: Whistler’s work is tiny, almost negligible, and van Dyck’s portrait of an English noblewoman in mourning isn’t particularly inspiring. The Sargent, on the other hand, while not one of his famous society portraits, bears a sustained glance. 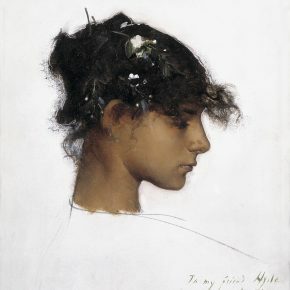 In fact, it seems important precisely because it doesn’t announce itself with the bravura brushstrokes of his society work: the portrait of Rosina Ferrara, a young girl Sargent met in Capri when in his early 20s, and who was a frequent model during his stay on the island, is an understated piece, careful brushwork bringing out the subtle charms of her face in profile. As private collections like this tend to be, the Berger Collection is idiosyncratic, featuring lesser works by greater names, and greater works by lesser ones, but it does provide an intriguing if brief survey of five centuries of British art. The exhibit has been organized chronologically, the earliest work a 14th-century crucifixion panel which, with its cartoon-like figures, brings a touch of the Middle Ages in a room dedicated to Renaissance portraiture. 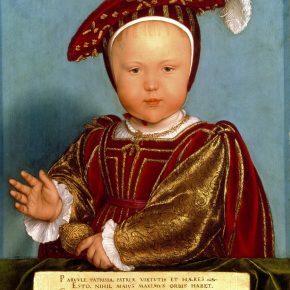 Among these latter there is a portrait of Henry VIII, shown as a young man looking nothing like the Holbein portrait we have come to associate him with, as well as portraits of two of his children: Edward, as a baby, painted by Holbein and looking very much like an infant version of the portrait we know well; and a sour-faced Elizabeth painted 12 years into her reign, recently excommunicated by the Pope and facing enemies from within and from without. In the room dedicated to the 17th century, formal portraiture is joined by history painting. General George Monck, an important figure during the English Civil War, is shown in gleaming armor, a barely visible formation of soldiers in the distance. Monck was a Royalist who while imprisoned turned to the Parliamentarian side, becoming an admiral in the navy and governor of Scotland; but after the death of Cromwell, he helped to depose the son, Richard Cromwell, and was largely responsible for restoring Charles II to the throne (which explains all the pomp and finery that surrounds Monck in this portrait). The portrait hangs next to a battle scene by Adriaen van Diest (that’s right, British art here does not necessarily mean art by Brits), showing a battle during the Second Dutch War in 1665 (the 17th century was not a peaceful one for the British). In the 18th century, portraiture was still very much in vogue, and its range became broader and more intriguing: among high society it became all the rage to have oneself painted in a classical or biblical pose. Anne Gardiner got two for the price of one when she posed with her son Kirkham — the painting brings to mind both the Madonna and child, and Venus and Cupid. Susan Rushbrooke wanted her portrait done in profile, to resemble Roman coins — a fancy that artist John Downman was willing to indulge, but he insisted his sitters be shown in contemporary clothes, and the gossamer-thin shawl she wears in this miniature is executed with consummate skill. For another virtuoso touch, look for the portrait of Queen Charlotte by Benjamin West: from the right angle(s), the glass face of her wrist band looks three-dimensional. One of the most famous portraitists of that century was Thomas Gainsborough, but he is represented here by a different forte—and his personal passion—landscape. As the exhibition tombstone indicates, Gainsborough liked to work from his imagination rather than real life and it shows in this painting. 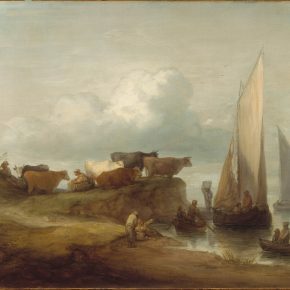 “Coastal Landscape” is an unnaturally crowded scene, packed with a dozen peasants, half a dozen cattle and four boats. It is a daydream of the rural childhood Gainsborough remembered rather than a scrupulously rendered piece of reportage. In color and tone it is much closer to the artists that would follow him, like Constable (who also appears here), than it is to his own, much darker work on exhibit at the UMFA right now (see left column). The Brits are well-known for their equestrian art, a genre well-represented in the Berger Collection. The most famous of equestrian artists was George Stubbs, who was known as “the horse painter” and produced a textbook on the anatomy of horses that aided generations of painters. 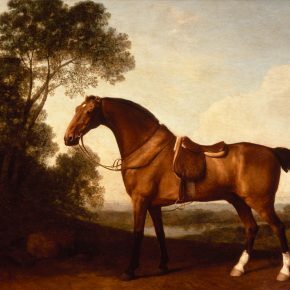 His 1786 painting of a saddled bay hunter is as refined and classical as any portrait of the period. Compare it with James Ward’s “A Cossack Horse in a Landscape” and the shift from the Neo-Classic to the Romantic is evident. Stylistic evolution in equestrian art extends into the 20th century with the works of Sir Alfred J. Munnings. The mundane setting of his portrait of the famous racehorse Tiberius is in marked contrast to the fame of the subject, and he manages to capture the strength and poise of the prize-winning horse with just a few gleaming brushstrokes. And in “The Start of a Horse Race,” which has touches of both Degas and Delacroix, Munnings’ stormy brushwork and off-balance composition manages to capture the excitement of a mad dash of beast and man about to begin. As loose and expressionistic as Munnings strokes are in this 1952 painting, they were still outdated compared to the then-dominant abstract expressionism. But this was a style that never really caught on in Britain, where leading avant-garde artists like Francis Bacon and Lucian Freud remained wedded to the figure. One of the few artists that we do associate with abstraction in the British post-war period is Howard Hodgkin, whose late work, “Storm,” is full of bright color and luscious brushstrokes, and closes out this survey of British art. Like brands, names can obscure as much as they can entice. 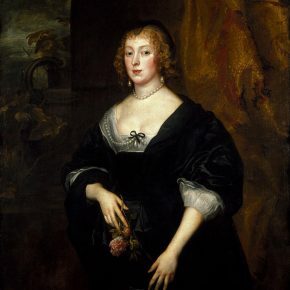 In Utah, a chance to see a van Dyck or a Constable, major or minor, is reason enough to visit Treasures of British Art,1400-2000: The Berger Collection, where the cost of the gas it takes to get you to Provo is the price of admission. But the exhibit’s success is much more than a list of names: the most interesting portrait of the entire show—of a mother and her two sons in the 16th century—is attributed simply to “English School;” and while the fact that David Hockney’s name appears here as subject rather than artist will disappoint many, Adam Birtwistle’s portrait of his colleague as a strong yet enigmatic, working-class hero is the type of painting that will stay with you long after you’ve left the building. 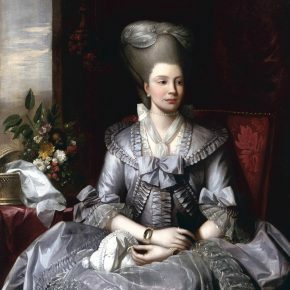 Treasures of British Art, 1400-2000: The Berger Collection, is at the Brigham Young University Museum of Art in Provo through January 5, 2016. This article appeared in the September 2015 edition of 15 Bytes.